This anthology includes four novellas by proven authors, three that add to ongoing series and one that introduces a new series. I’m a fan of anthologies, and I am particularly delighted when I find one in which all the contributors are authors whose books I enjoy. This was the case with Ask Me Why. The anthology opens with “Midnight Bet” by Jodi Thomas. As with other stories in Thomas’s Harmony, Texas series, there is more than one plot threaded through the novella. Cousins Rick and Lizzy Matheson are on their way home after a family reunion when someone shoots at them, injuring Lizzy. The shooting serves to jumpstart the love life of both Rick and Lizzy. Rick is still longing for the mysterious federal marshal Trace Adams (Chance of a Lifetime), and she’s back in town and back in Rick’s bed. But for how long? Lizzy seeks help from her neighbor, reclusive veterinarian Brandon McCall, and ends up losing her heart. But is he willing to become a lover as well as a friend? As several reviews here attest, I’m a big fan of Thomas’s Harmony books, and this novella is just another on my list of Harmony visits I have loved. I was happy to see the Rick-Trace story concluded, but I adored Lizzy and Doc. Nobody does the misfit turned hero/heroine better than Thomas. She is a genius at revealing the heart and vulnerabilities of such characters and capturing the reader’s affection for them in the process. Plus, I confess I fell in love with Doc when I read this line: “The doctor was a mixture of the actor Jake Gyllenhaal—add a few years—and Sam Elliot—take away thirty years.” Two thumbs up for this one. Marie Force’s “You’ll Be Mine” invites readers to return to Green Mountain, Vermont, for the wedding of Cameron Murphy and Will Abbott (All You Need Is Love). The Abbott siblings (Will has nine), parents, grandfather, and assorted other family members and friends gather for this long-anticipated event. Even Fred the Moose makes an appearance. All is laughter and love, sweetness and sizzle, family and fun, humor and heart in this celebratory novella, although Cameron is a bit concerned that her wealthy, sophisticated father may break the heart of a Green Mountain lady. I loved this one too, but I’ve read all of the Green Mountain books and am invested in the series. Readers who haven’t read at least the first book, Cameron and Will’s story, might find themselves lost among all the characters. Series fans, on the other hand, should enjoy every moment. 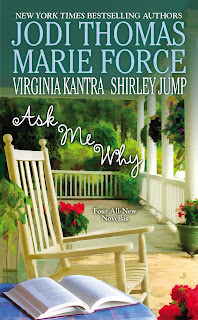 Shirley Jump’s “Wrapped Around Your Finger” introduces her Southern Belle Book Club series. (When Somebody Loves You, the first novel in the series will be released October 6.) Maggie McBride has a week’s vacation from her job with Stark Construction, and the timing is perfect for her to return to Chatham Ridge, Georgia, for the wedding of her almost life-long best friend. Maggie, who is not a girly girl, is not wildly enthusiastic about wearing a dress and heels, and she is even more dubious about accepting Rachel’s dare to bring Nick Patterson along since Maggie needs a date. Nick and Maggie are colleagues and buddies. He calls her his “work wife.” But Nick changes girlfriends faster than he flips houses, and Maggie, having been burned by a charmer who proved faithless once, is determined not to repeat her mistake. Still, how does one refuse a friendly dare? What Maggie doesn’t know is that Nick has fallen for her and recounts his fictional amours hoping to provoke her to jealousy. Can these two friends move past defenses and false impressions to find their happily-ever-after? This is a sweet story with likeable characters, a fun read. And it has a friends-to-lovers plot, a tomboy heroine, and a small-town setting—three of my favorite things in romance fiction. I enjoyed this one enough to add When Somebody Loves You to my book calendar. 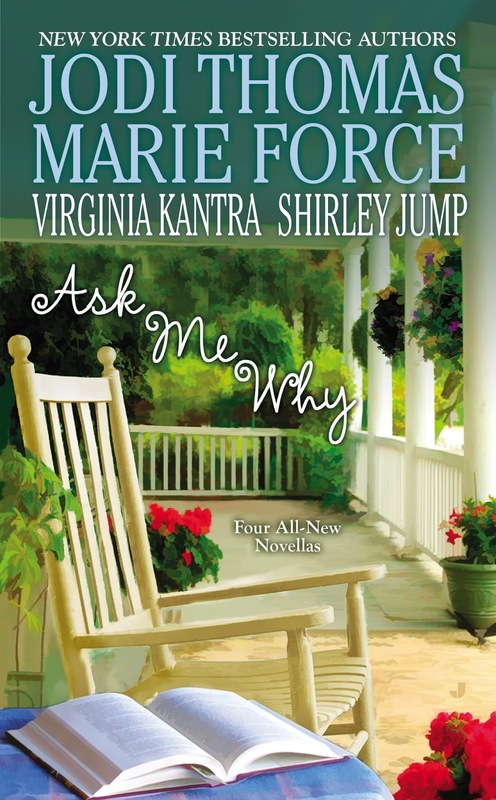 Virginia Kantra’s “Carolina Heart” is part of her Dare Island series. Cynthie Lodge, the single mother of two daughters—twelve-year-old Maddie and eight-year-old Hannah—is doing her best to forge a new life for herself and her daughters. No longer a wild child, she works hard as a waitress at the Fish House, taking classes to become a dental hygienist, and spending every spare moment with her daughters. She’s determined to prove she’s smarter than she has been given credit for being, and part of that proof is declaring a moratorium on men in her life. But then she meets Max Lewis, genius biological oceanographer and all-around good guy who believes in Cynthie and likes her kids and is pretty darn irresistible. Max had a crush on Cynthie in high school. He didn’t have a chance then, but he is determined this time that the nerd will win the girl of his dreams. Kantra’s Dare Island series is quite simply one of the best small-town series ever, and “Carolina Heart” shows why. These characters are so real I want to hug them. I care deeply about their achieving happiness. I want Cynthie to believe that she’s smart and competent. I want Max to know a nerd can be a heart-stealing hero. I want Maddie and Hannah to have a father who loves them and champions them. Kantra writes the kind of stories that keep me reading romance. I should add that it is not necessary to have read the Dare Island novels to fall in love with this story. Nevertheless, I highly recommend the novels. Carolina Dreaming will be released February 2, 2016. Overall, this anthology is a definite win for readers. It’s even better than I expected, and it was on my list of most highly anticipated books back in January. Don’t miss this one. Sounds like a lovely collection that I would enjoy. I love Jodi's books and look forward to reading this one along with the other stories. Loved all the stories from four favorite writers. I loved the Kantra story and am looking forward to reading the rest. Thanks, Janga! Great review, Janga! I love anthologies that as you say, " in which all the contributors are authors whose books I enjoy." However I have found many favorite authors when the anthologies include lesser known writers that also have become favorites as they flower into better and more well known artists. I love anthologies - sometimes I'm just in the mood to read a shorter story. I've already bought it, but it's in line. :) Great review! Great authors,sounds like an awesome read! These are some of my favorite authors and although I haven't been able to keep up with these series, I have enjoyed all of their books I have managed to read. I love anthologies, so this one will go to the top of my Wish List. Thank you for the review and bringing it to our attention.